This is a short tour, but it gives the participants just enough time to acclimatize and train on two peaks before climbing the Matterhorn. This is the minimum to insure success. 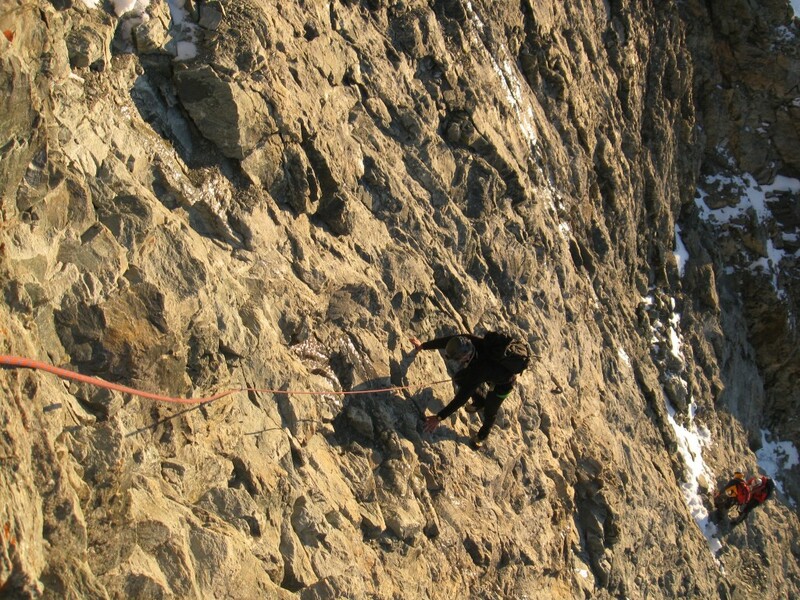 If you feel you need more practice, if you do not have all the skills necessary I suggest the 7/8 days tour that will give you more time to learn all necessary techniques and become familiar with alpine climbing style. Day 2: Lift ride to klein Matterhorn, traverse of Breithorn plateau and Di Verra glacier ascent of pollux 4092m/13’299ft, descent to Vald’Ayas refugio. Day 3: Ascent and traverse of Breithorn, 4076m. a great ridge traverse with snow,ice and rock climb. Return to Zermatt. Day 4: Hike to Hornli hut, reconnaissance of the bottom part of the Matterhorn that we will climb in the dark the next morning. Day 5: Ascent of Matterhorn, 4476m. A long day that start at 3:00 am and last for 10 to 12 hours. Return to Zermatt that day. Any time between June 15 – September 15 on a custom basis. The training portion is done on a 2:1 ratio. The Matterhorn ascent is done on a 1:1 ratio Tour for bigger group can be easily organize, but the Matterhorn ascent remain with 1:1 ratio. Extra guides will join the group just for the ascent. Transport during the tour, Cable car to Klein Matterhorn. Radio, first aid kit, rope, climbing hard ware.